The Tigers needed his five RBIs to win the game, but afterward Gary ran out of steam between then and the end of the 2008 season, stalling just one shy of joining the exclusive 500 Home Run Club®. He ended the year parked at 499. As it turned out, he never hit another round-tripper for the Tigers, who cut him during the last week of training camp. 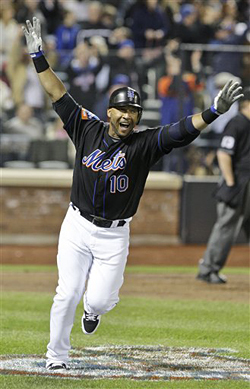 But he was snapped up just days before the start of the 2009 season to play in the NY Mets’ beautiful new Citi Field. Then on Friday, April 17, after nearly seven months of waiting, the 9-time All-Star launched a full count pitch off of Milwaukee Brewers’ reliever Mitch Stetter an estimated 385 feet to become the 25th member of The 500 Home Run Club®. Aside from helping his new team beat the Brewers 5-4 Sheffield was most excited about joining another new “team” of baseball’s greatest all-time sluggers. “Just to join that 500 Home Run Club, you know. Now I can say I'm in the club…it's like getting your degree. Nobody can never take that away from you," he said with a mega-watt smile. The ball was hit out in typical Sheffield fashion - a bullet to the left field seats at beautiful new Citi Field. Sheff pumped both arms in the air as he approached first and rounded the bases as cameras flashed all over the ballpark. 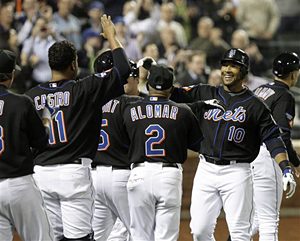 He touched home plate and pointed to the sky with both arms before being mobbed by his New York teammates. At 40 years, 143 days, Sheffield was the fourth-oldest player to hit 500 behind Willie McCovey (40 years, 171 days), Eddie Murray (40, 194), and Ted Williams (41, 291). The latest to join the club, he followed less than a year behind the 24th member Manny Ramirez -- and three others Jim Thome, Alex Rodriguez and Frank Thomas who passed the 500 dinger plateau in the previous two seasons, a flurry never before seen in MLB history. 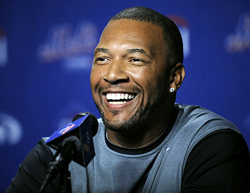 Although still officially listed as a free agent, it’s questionable whether Gary Sheffield will return to add to his career total of 509 homers, which places him at 24th all-time between Eddie Murray (504) and Mel Ott (511). But even if he never knocks another, he will always be remembered as the player who hit the 250,000th home run in the history of Major League Baseball.